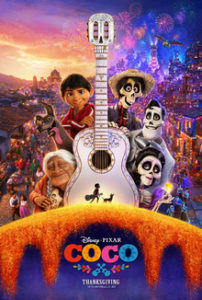 The latest Pixar offering, Coco, is a wonderful film which has instantly become one of our family’s favorites. It is technically brilliant, demonstrating how far computer animation has come in the more than 20 years since Pixar’s beginnings. The visual detail, the lighting and the color are superb, and it is all easy to take in despite being so complex, unlike much of the CGI that accompanies live action movies these days. The story is excellent as well, and I can’t write much at all about it without spoiling it, except to note that it is fancifully set in Mexico, and while it has action-adventure elements it is really a family drama. Coco actually has some things in common with another recent animated feature, Kubo and the Two Strings, which uses stop-motion instead of CGI, giving it an older and artsier look. 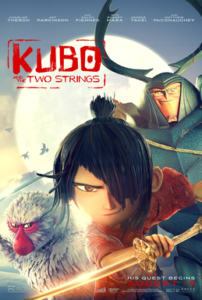 Kubo is also more of an adventure movie, a mythological tale whose narrative is not quite as engaging as Coco’s, though it is not without its own twists. But again – no spoilers! Each of these films appropriates a facet of world culture to tell a high-stakes story that reminds us to cherish our loved ones. If you’re looking for a satisfying family movie night, you can’t go wrong with either one.